Hot tub removal. Ugh. What a pain. But, you’re hot tub isn’t the glorious and relaxing oasis it used to be and is now nothing more than an eyesore. It’s leaking and not heating like it should, so, you think you’re stuck with it. You can deal with an old hot tub by disconnecting and removing it. The biggest problem you’ll have it to get it off your property or out of a foreclosure because you can’t sell it or give it away. Another problem on your hands is the fact that it won’t be easy to disconnect it because it’s backed into a corner. Fortunately, this is an easy job, you’ll only need a few hand tools and a helping hand to remove your hot tub. 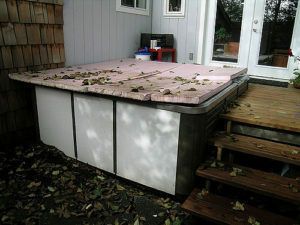 All you’ll have to do, with most hot tubs, is to disconnect the water supply, the electrical supply, and remove the skirt. What isn’t so easy is disposing of the materials. You can’t just drag the disassembled unit out onto the curb. Or, put it trash bin piece by piece. Make it easy by scheduling junk removal to pick it up, along with anything else you don’t need. Drain the hot tub. If the hot tub is full of water, drain it to make it easier to move later on after you’ve disconnected it. You might have to use a wet-dry vac to get out all the water. Turn off the electricity. You should do this first at the breaker box, then, unplug it from the electrical outlet. You might have to pull off or open-up a panel in order to get to the electrical connection on the tub itself. If you can, pull the cord out and wind it up to avoid tripping over it. Disconnect the water supply. Using channel locks or a wrench, disconnect the water supply from the hot tub and from the supply. These can be very difficult to loosen and might cause the lines to break. Disassemble the tub itself. Now, you can opt to disassemble the tub or leave it whole. If you do choose to cut it up, you’ll have to dispose of the materials. Keep in mind, this will be messy work, so it’s usually best not to cut the tub apart. If you need hot tub removal, just phone 800-433-1094 or visit Junk Garbage Removal.